Boss Katana 100 Amplificatore per Chitarra.SPEDIZIONE GRATUITA!!! La Katana—spada tradizionale degli storici samurai giapponesi—è un simbolo di onore, precisione, e di abilità creativa nella cultura giapponese. Inoltre, il Katana-100 include l’accesso integrato a 55 effetti BOSS, che sono personalizzabili utilizzando l’editor software gratuito BOSS Tone Studio. 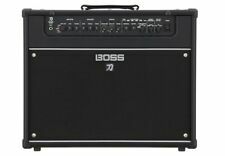 BOSS KATANA 100 AMPLIFICATORE COMBO PER CHITARRA 1x12" 100W. Power: 100 W. Weight: 14.8 kg. Built-in tilting stand for optimal monitoring. Inoltre, il Katana 100 include l’accesso integrato a 55 effetti BOSS, che sono personalizzabili utilizzando l’editor software gratuito BOSS Tone Studio. Caratteristiche Boss Katana 100. Produttore :BOSS. BOSS Katana 100AMPLIFICATORE COMBO PER CHITARRA ELETTRICA. una vasta gamma di effetti BOSS, che sono personalizzabili utilizzando il software gratuito BOSS Tone Studio. Una scelta di 55 effetti personalizzabili con l’editor software BOSS Tone Studio. Gliamplificatori Katana hanno ricevuto consensi in tutto il mondo per i loro tono e feel valvolari autentici, gli effetti integrati Boss ed il valore eccezionale. Caratteristiche Boss Katana Artist. Produttore :BOSS. Katana, das traditionelle Schwert des japanischen Samurai, gilt in der japanischen Kultur als Symbol für Ehre, Präzision und Kunstfertigkeit. Im Zuge der Weiterentwicklung der Waza-Verstärker entstanden, repräsentieren sie die Vision der BOSS-Ingenieure vom ultimativen Rock-Sound. Fruto del proceso de desarrollo del aclamado amplificador Waza, estos innovadores amplificadores personifican el deseo de BOSS de encontrar el sonido de rock definitivo. Además, el Katana-100 incluye acceso integrado a 55 efectos BOSS, personalizables con el software de edición gratuito BOSS Tone Studio. 4 Speicherplätze für Verstärker und Effektsettings plus Panel-Setting. - 3 gleichzeitig nutzbare Effekte. - Optionaler Fußschalter: Boss FS-6. - 1x12# Custom Speaker. - Gewicht: 14,8 kg. - 3-Band EQ. 4 Speicherplätze für Verstärker und Effektsettings plus Panel-Setting. - 3 gleichzeitig nutzbare Effekte. - Optionaler Fußschalter: Boss FS-6. - 2x12# Custom Speaker. - Gewicht: 19,8 kg. - 3-Band EQ. Fünf einzigartige Verstärkertypen: Clean, Crunch, Lead, Brown (bekannt aus den Waza-Verstärkern) und Acoustic (für Akustik-Gitarren). Katana, das traditionelle Schwert des japanischen Samurai, gilt in der japanischen Kultur als Symbol für Ehre, Präzision und Kunstfertigkeit. Caratteristiche Boss Copertura per Katana 100. Progettata per l'amplificatore per chitarra elettrica Boss Katana 100. Produttore :BOSS. Custodia originale Boss per amplificatore 100WKatana 100. Cover nera con logo Boss ricamato. PERMUTIAMO IL TUO USATO ANCHE A DISTANZA! Inoltre, Katana-100 include l’accesso integrato a una vasta gamma di effetti BOSS, che sono personalizzabili utilizzando il software gratuito BOSS Tone Studio. Up for sale aBoss Katana-Head 100/50/0.5-Watt COSM Compact and Powerful Guitar Amplifier Head! We are anAuthorized Dealer ofBoss Products! - Effects selection expanded to 61 different types; Roland DC-30 Analog Chorus-Echo, BOSS GE-10 Graphic Equalizer, and 95E pedal wah added. This amp also includes integrated access to a huge range of BOSS effects, which are customizable using the free BOSS Tone Studio editor software. In addition, the versatile Katana Head is equipped with an effects loop and MIDI for integration with advanced rigs, and features a convenient built-in monitor speaker for tone preview and practice without a cab. In addition, the Katana 100/212 includes integrated access to a huge range of BOSS effects, which are customizable using the free BOSS Tone Studio editor software. Lead has a wide gain range to suit many styles, from fat, stinging blues solos to fluid legato shredding. 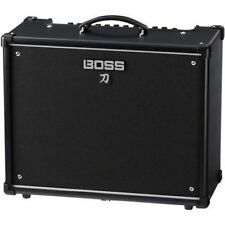 BOSS Katana 100 - 100-Watt 1x12" Guitar Combo Amplifier. Katana—the traditional sword carried by the historic samurai of Japan—is a symbol of honor, precision, and artistry in Japanese culture. [EQUALIZER]. We are anAuthorized Dealer ofBoss Products! The update also includes newly added channel and global EQs for refined tone-shaping, powerful Cabinet Resonance and Air Feel direct out functions derived from the Waza amp series, and many other great features. A standout characteristic of every Katana amp is the dynamic interaction between its output section and the speaker, which provides the ultra-responsive musical experience that players crave. In addition, this Katana 100 includes integrated access to a huge range of BOSS effects, which are customizable using the free BOSS Tone Studio editor software. With five distinct amp "characters" to choose from, support for acoustic-electric guitars, and access to a wide range of customizable effects, the BOSS Katana 100 combo amplifier represents a new generation of flexible amplifiers for practice and performance. Boss Katana-100/212 2x12" 100w Combo Amp "Excellent Condition"
In addition, the Katana-100/212 includes integrated access to a huge range of BOSS effects, which are customizable using the free BOSS Tone Studio editor software. Five unique amp characters: Clean, Crunch, Lead, Brown (derived from the Waza amp), and Acoustic (for acoustic-electric guitars). Lead has a wide gain range to suit many styles, from fat, stinging blues solos to fluid legato shredding. The Acoustic character further enhances the Katana’s versatility, providing optimized tone that makes acoustic-electric guitars sound stunningly natural. Katana—the traditional sword carried by the historic samurai of Japan—is a symbol of honor, precision, and artistry in Japanese culture. The amp also includes integrated access to 55 BOSS effects, which are customizable using the free BOSS Tone Studio editor software. BOSS Katana 100/212 Combo Amplifier Features Amp characters include Clean, Crunch, Lead, Brown (derived from the BOSS Waza amp), and Acoustic (for acoustic-electric guitar). Computer Connectivity: Access BOSS Tone Setting editor software and Boss Tone Central (USB). The update also includes newly added channel and global EQs for refined tone-shaping, powerful Cabinet Resonance and Air Feel direct out functions derived from the Waza amp series, and many other great features. Boss Katana 100 Combo Amp. Katana Version 2 is a free, user-installable update for all Katana owners, and is available in the. Katana Version 2: Expanded Effects, More Tone Settings, and Increased Performance. Choose from 55 customizable effects with BOSS Tone Studio editor software. Five unique amp characters: Clean, Crunch, Lead, Brown (derived from the Waza amp), and Acoustic (for acoustic-electric guitars). Crafted tones, forged for rock. In addition, the Katana-100 includes integrated access to a huge range of BOSS effects, which are customizable using the free BOSS Tone Studio editor software. The update also includes newly added channel and global EQs for refined tone-shaping, powerful Cabinet Resonance and Air Feel direct out functions derived from the Waza amp series, and many other great features. Manufacturer Part Number: Katana Artist. Software: Boss Tone Studio Editor. Outputs: 2 x 1/4" (16 ohm), 1 x 1/4" (8 ohm internal speaker), 1 x 1/4" (headphones/record out), 1 x 1/4" (line out with Air Feel).